You should really see this: https://act.represent.us/sign/secrecy-bill-az?source=taf . RepresentUs has a smart plan to fix our broken political system. Check it out. State politicians are trying to stop the voters from passing a measure that would end secret money in local elections. The Arizona House passed a bill that would make it illegal for cities to pass exactly this kind of transparency measure. Now the bill is in the Senate, and a vote could happen any day. We need to make sure that every Arizona state senator hears protest and outrage from the public, to make them think twice about passing this bill. Add your name to the petition to the Arizona Senate telling them to stop fighting the people and vote NO on this pro-secrecy bill. 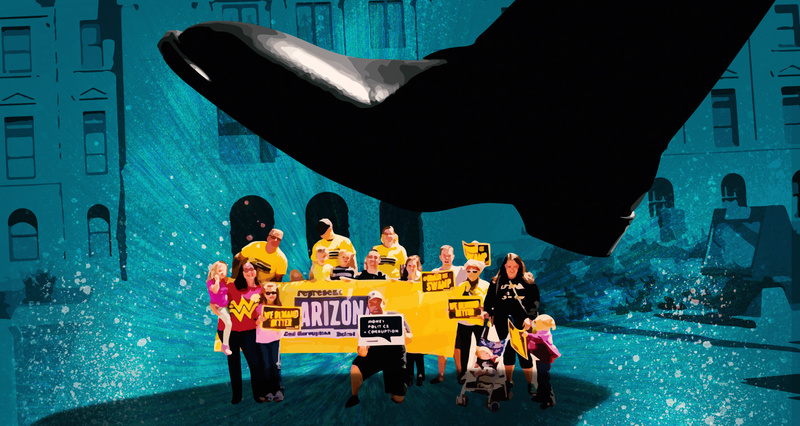 RepresentUs members in Tempe worked for months with a local coalition and the city council to get this ordinance on the ballot and demand an end to secret campaign money. The bill the Arizona legislature is advancing would bar cities, counties, and the state from ending secret money. This bill not only undermines the voters in Tempe, but puts in place a secrecy law that would stop local control in all Arizona communities that want more transparency. We still have a chance to stop this bill – but the Senate will only hear us if thousands of people speak out against it. Add your name to the petition now to tell Arizona politicians to vote NO on HB2153. I am writing to urge you to vote NO on HB2153. HB2153 will trample local power and protect dark money. It's a slap in the face of voters and will hurt transparency efforts in cities and counties across Arizona. Stand with the people. Vote NO on HB2153.